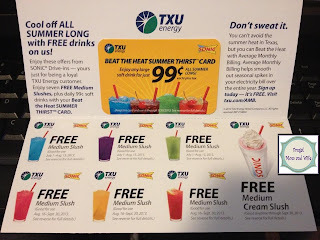 Frugal Mom and Wife: TXU Energy Customers Get Free Drinks at SONIC and Discount Drinks Too! TXU Energy Customers Get Free Drinks at SONIC and Discount Drinks Too! Are you a TXU customer? Coupons for 7 Free Drinks with no purchase required was inside!! and that's through the end of September at SONIC. they will then adjust your total and you KEEP the card!! Go check that dreaded bill because there is actually something good inside! !